The world is experiencing a global sanitation crisis, and the majority of available sanitation technologies are dependent on scarce water resources, cause a cascade of negative environmental consequences, have prohibitively high start-up costs, and are financially unsustainable. The effects of this crisis are particularly devastating in Haiti, where diarrhea accounts for 16% of deaths in children under 5. In order to address this crisis, a small group of innovative non-profits (including SOIL!) and social businesses are beginning to test the paradigm-shifting hypothesis that market-based models may offer a solution. As this is such a new and critical field of study, SOIL is committed to sharing lessons learned and project outcomes widely in order to support continued innovation and replication globally. So we’re thrilled that SOIL’s EkoLakay household toilet project was featured as a case study in the recent Hystra report, “Designing the Next Generation of Sanitation Businesses.” We highly recommend this report to all the sanitation and social business nerds who read SOIL’s blog! 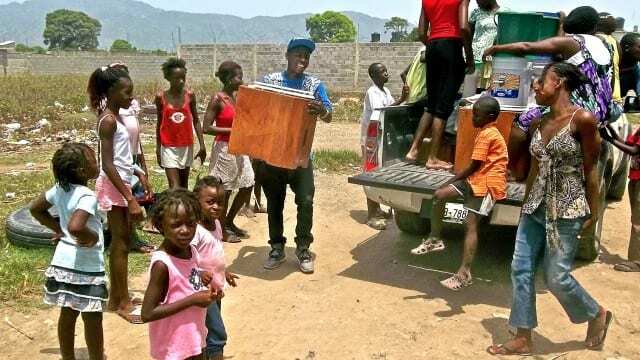 Delivering new SOIL EkoLakay toilets in the Nazon community outside of Cap-Haitien. In SOIL’s simple system, customers rent an EkoLakay toilet for approximately $5 USD per household to have their wastes collected and fresh buckets with carbon cover material (used for flushing) delivered weekly. The initial cost of the toilet (approximately $50 USD) is also incorporated into the monthly maintenance fee so that it will be paid off over a period of several years. SOIL then picks up the buckets of waste on a weekly or bi-weekly basis (with the SOIL Poopmobiles!) and dumps them at SOIL compost site. Then, through a carefully-monitored process that meets and exceeds the World Heath Organization’s (WHO) standards, the waste is mixed with carbon matter and undergoes a rapid decomposition process for 6+ months until it is transformed into nutrient-rich compost that can be sold for agricultural purposes. Revenue from monthly toilet user fees, waste treatment fees, and compost sales is collected to support ongoing project costs and to showcase the private sector potential to affordably and sustainably provide sanitation services in the world’s most impoverished communities. SOIL’s model is also one of the few interventions around the world that has showed early success in creating a financially-sustainable service, and we look forward to scaling up this effort in the coming year. Thank you to Heiko Gebauer at the Swiss Federal Institute of Aquatic Science and Technology (Eawag) and Grégoire Virard (SOIL and Eawag’s social business consultant!) for contributing research. We’re also incredibly grateful to Grand Challenges Canada, the 11th Hour Project, the American Red Cross, and Foundation Beyond Belief for supporting the continued scale-up of SOIL’s EkoLakay social business pilot in Haiti. Finally, mil mèsi to the continuing support of our partners and collaborators at the Centre for Affordable Water and Sanitation Technology (CAWST), the Lawrence Berkeley National Laboratory, Re.Source Sanitation, and the Schwab Foundation for Social Entrepreneurship. We couldn’t do it without you! No Replies to "SOIL Featured in Hystra Report, “Designing the Next Generation of Sanitation Businesses”"